THERE are some books or pieces of literature that anger the reader when certain issues are raised by the author. Emecheta’s Second Class Citizen is one of them. As a female writer, Emecheta is not apologetic when she writes about the plight of fellow women living in any given society, especially the African society. Her book, Second Class Citizen, which is under review this week, is a piece of literature that brings to the fore pertinent issues that affect women. It is a book that reflects some negative practices in Africa, the setting being Nigeria, and zooms into abuse of women and how patriarchy seems to take centre stage. The writer of books such as The Joys of Motherhood, The Bride Price, The Slave Girl and The Ditch, Emecheta presents her protagonist in Second Class Citizen as indeed a ‘second class citizen’. Emecheta’s central character, Adah, had to suffer a double blow as her family did not appreciate her while society despised her simply because she was born a girl. The protagonist suffers not only because she is a girl-child, but because she had to live in a society dominated by her male counterparts and the white race while she is black. However, what is frustrating about Emecheta’s book is that Adah, though presented as bright and intelligent, is ironically naive, which contributes to the story’s pitfalls. Through Adah, Emecheta presents the African society as a place that can destroy a girl-child’s confidence in social development in that she is side-lined in making decisions about her future. “She was not even quite sure that she was exactly eight, because, you see, she was a girl. She was a girl who had arrived when everyone was expecting and predicting a boy. So, since she was such a disappointment to her parents, to her immediate family, to her tribe, nobody thought of recording her birth. She was so insignificant,” writes Emecheta. The bad part about a patriarchal society is not only male dominance, but the idea that fellow women are also oppressors of the girl-child. The first chapter of the book is crucial in that it does not only reflect the comparison of a boy and a girl-child, but reflects how the African man has been conditioned to appreciate what is more European than African. In Second Class Citizen, Emecheta highlights how the people of Ibuza went out of their way to prepare for the homecoming of a boy-child who had studied law in the UK. To them, it was the education from abroad that fascinated them to the extent of presenting themselves as ‘Europeans’ so that in their minds they could be ‘closer’ to him. Writes Emecheta: “The Ibuza women who lived in Lagos were preparing for the arrival of the town’s first lawyer from the United Kingdom. The title ‘United Kingdom’ when pronounced by Adah’s father sounded so heavy, like the type of noise one associated with bombs. As the writer of the book, Emecheta whips up anger in the reader when she highlights how Adah is mistreated as a woman to the extent that she took the role of looking after her husband’s family as well as footing her husband’s tuition. It is considered tradition in her society that, as a woman, she does not complain but adhere to societal norms which allow her to be married under-age. Emecheta’s role in writing such a book is to question such practices that oppress women while she encourages women to empower themselves. 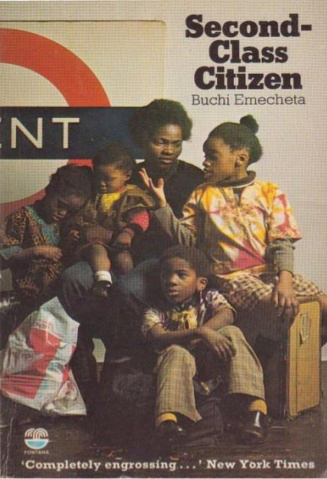 Buchi Emecheta’s book reflects some practises which affect the girl-child like early marriage. “For instance, Adah learned very early to be responsible for herself. Nobody was interested in her for her own sake, only in the money she would fetch and the housework she could do, and Adah, happy at being given this opportunity of survival, did not waste time thinking about its rights or wrongs. She had to survive,” writes Emecheta. In Second Class Citizen, Emecheta also tackles the issue of poverty which is facing many in the Diaspora who leave their homes in Africa in search of greener pastures. Interesting about Emecheta’s book is that she highlights that the grass is not greener on the other side. Second Class Citizen addresses many issues dogging African society and it’s a must-read.